Eleven years have passed since Toy Story 2 (fifteen since the original), and in their decision to revisit this Pixar classic (the original was nominated for three Oscars), the studio clearly must have searched for some way to dust off these toys for a new generation of kids and their parents. The most logical solution - and one that largely works - is to enter the story after a similar passage of time, so that Andy, the kid who owns the bevvy of come-alive toys, including the classically loyal Woody and the irrepressible Buzz Lightyear, is now a teenager, about to go to college. Like all boys who have grown up, Andy must put away childish things: including the gang of loyal toys, who are destined to go into the attic (except for Woody, clearly the favorite who will go with Andy to college). That Andy isn't too bright, however. Instead of packing the toys into the box marked "attic" he carelessly puts them into a trash bag, and...well, you get the set up. The toys end up at Sunnyside Daycare - at first a seeming paradise of kids who forever play with toys, but looks can be deceiving. The Daycare is ruthlessly ruled by a big huggy bear named Lotso (Ned Beatty) who has the entire place under his thumb. The new recruits are sentenced to be battered by under aged toddlers (a fate worse than death), Buzz is rebooted into a prison guard, and it's up to Woody to figure out a way to rescue the lot. I happened to see this film at a vulnerable time - while visiting my mother in the hospital at my childhood home - so the film's themes of childhood lost and toys being torn asunder struck me, perhaps, a bit more than it might otherwise. There's no pulled punches here as the film pulls out all the stops: old dogs grown fat, pet horses with wide eyes crying as their friends say goodbye, a lost city of unwanted toys with all the pathos of Spielberg's AI. The movie seems a bit relentless and I suppose I'm not the only one feeling unexpectedly (and perhaps a bit unpleasantly) touched. However, despite the wide praise for re-imagining the truisms of age, growing up, and separation, the movie is at its most inspired when its reprising the Sixties classic, The Great Escape: Woody comes up with a plot to distract the monkey guard (the monkey, who alerts Lotso with a maniacal clanging of his cymbals and a wild look in his eyes whenever he spies an escaping prisoner, is the best joke in the movie), while his compatriots plot to cross the prison yard patrolled by Tonka trucks and a sparkly purple squid. This movie feels very influenced by Pixar's latest success - Up - another picture that dealt with the changes of life and which was able to capture the sadness of life's passages with prickly characters, a clever metaphor and vivid imagination. 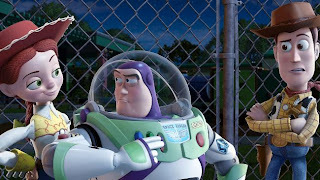 Toy Story 3 doesn't have the piquant succinctness of Up - it's an ensemble picture rather than a character study - so instead of building toward a deeply moving reconciliation, it needs to tug insistently on our heart strings every so often in between frantic, half-comic run-ins with life and death. This both makes it more serious and deep than earlier Toy Stories and not quite as deftly good as Pixar has become with movies like The Incredibles and Up. This Toy Story may in fact be both a little dark for younger kids and a little young for adults. One almost wishes it didn't have the history of the first two Toy Stories behind it: the approach here is to try to get at something more serious this time, but since we already know the characters so well, the movie suffers a bit from not letting us get to figure out what these toys still have to learn about each other. Even if it's uneven, and not quite emotionally pulled together, it clearly illustrates the facility that Pixar has learned for this kind of thing. First The Increadibles gave us a comic riff on rekindling the magic in middle-age. Then Up delighted us with the pathos and rejeuvination that comes with old age. Now Toy Story 3 gives us a treatise on growing up and a lesson in leaving childhood behind. That studio has really become the most effective storyteller of life lessons in well over a generation, of the likes we haven't seen in ages - a postmodern Frank Capra. And they do it all with clever animation. Incredible, indeed.